For the next few months, I am going to be doing a weekly blog posting about Showtime’s The Tudors that will cover what parts are Hollywood and what parts are based on real history. If you have missed episode 1 and 2 then they are out on DVD or you can download them off of itunes. The official release date for the first episode of season 3 is April 5th but you can watch The Tudors from OnDemand now if you are a Showtime subscriber. WARNING: THE FOLLOWNG CONTAINS SPOILERS. DO NOT READ FURTHER IF YOU HAVE NOT WATCHED EPISODE I OF SEASON 3. Behind the bodice ripping and way too pretty actors, The Tudors actually pulls together an amazing amount of historical details in the first episode of season 3. Let’s start with the truth…. We start with the marriage of Jane and Henry followed by a sumptuous banquet (Jane’s marriage took place in the Queen’s Closet at Whitehall). Jane gets a new puppy and Edward Seymour is made Viscount Beauchamp. Jane has her first meeting with the ambassador to Spain, Chapuys. Henry is forced to interrupt the meeting when the conversation steers toward Jane being the pacific queen that unites daughter Mary with Henry. For lucky wife #3, Henry wants the misses to stay out of politics so he reminds Jane to keep her mouth shut or suffer the same fate as Anne. Jane’s coronation is then conveniently postponed due to plague. Soon Jane is feeling the pressure as Henry becomes disenchanted with his new motherless bride. Henry’s right hand man, Cromwell is made Lord of the Privy Seals, which basically means he has the power to sign important documents like which monastery to burn today. Cromwell justifies his actions by complaining about priests being caught with their pants down (true) and religious hoaxes swindling the people out of their pennies (true). We see a few very smoky monasteries in the background, some desecrated statues, and Cromwell cracks a joke about the holy bible doubling as both reading material and toilet paper. (People raiding the monasteries really were wiping their bottoms with it). The smell of burnt crucifixes makes the evangelistic Cromwell rather giddy until he angers a few disaffected Catholics (roughly 40,000). This might not have been such a problem if it were not for the fact that Henry had only about 10,000 loyal soldiers to fight. You can do the math. These “pilgrims” all have one basic goal in mind….Cromwell’s head on a stake. Robert Aske is forced into the role of leader and voice of the people. He looks like he is about to kill puppies instead of head up a rebellion. 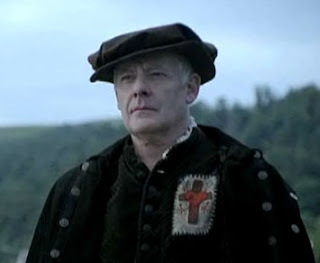 I thought The Tudors did an excellent job showing Aske’s dilemma of who to betray – his king or his religion. Flash to a terrified Mary who is told that her head is going to resemble a boiled apple if she doesn’t recognize Henry’s annulment from her mother and his all important title of Supreme Head of the Church. Against her conscience, Mary decides to sign and a touching renewal between Father and daughter follows where Mary gets to pocket 1000 crowns and keep her head. No one is hit harder than little Elizabeth who is living more like a pauper than a princess. 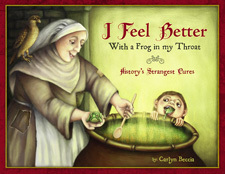 Her governess Lady Bryan is forced to write a letter to Henry begging for some money for dresses. But Henry is not in a magnanimous mood because his festering leg wound is making him terrible grouchy and he still has no word of a future son. Lady Rochford whines that Cromwell refuses to answer her letters and she is left without a penny to keep her living like a typical obsequious courtier. In truth, Jane Rochford wrote a groveling letter to Cromwell begging him to go to the king on her behalf so that she may secure her jointure. Although Cromwell did not get back Lady Rochford’s lands, he did secure for her an allowance of 100 pounds instead of 100 marks…. a significance raise. In fact, Lady Rochford most likely secured her position in Jane’s household through Cromwell. Even Cromwell could be a nice guy. A quick word about Queen Jane's attire...although I love the sumptuous and colorful dresses that Jane wears throughout the episode, the truth is that she dressed more like a women stuck on a polygamous ranch than a fashionista. Jane banned French fashions including the more flattering french hood and dressed in all black insisting that her ladies do the same. But who wants to look at a court full of young ladies dressed in dowdy black? Mary did recognize Henry as The Supreme Head of the Church but it was not really at the insistence of Chapuys. People like Nicholas Carew stood to lose much more if Mary did not sign. He was one of the many Catholics who begged Mary to sign. She really was feeling the pressure from all sides and I felt The Tudors could have dramatized this pressure a bit more. (The comment about Mary’s head turning into a boiled apple was also made by Norfolk and not Francis Bryan. ) Where did Norfolk go? I forget. Some serious license is taken concerning the Pilgrimage of Grace. In the Tudors, Brandon is asked to head up the army to end this whole messy business. In reality the Duke of Suffolk put down the Lincolnshire rebellion and the Duke of Norfolk out down the lengthier Northern rebellion. But alas, the producers probably knew that Henry Cavil (Brandon, Duke of Suffolk) would make a far sexier leader in these scenes. The Tudors has also compressed the rebellions to make the plot flow smoother. Technically, only the Northern rising is considered part of the "Pilgrimage of Grace" whose main objective was to take back 'the Cross of Christ'. The ring leaders in the Pilgrimage of Grace were Sir Robert Constable (NOT John Constable) and Robert Aske. Sir John Constable played a very minor role and was actually pretty adamant about not joining their cause. 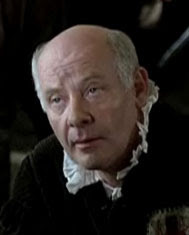 In the last scene, Henry threatens that Cromwell is going to be made a head shorter if he doesn’t put down the rebellion. In truth, Henry conquered the rebels by deception, not force. On the advice of Cromwell and Norfolk, Henry wrote a letter to the leaders agreeing to their demands. Aske returned to London and Henry conveniently changed his mind and had him executed (He’s the king…so he can do that). Because Cromwell’s advice saved the crown, Henry and him were as chummy as ever during this time. So although I appreciate Myers smoldering looks as much as the next person, I would have liked to seen a more 3- dimensional Henry here…someone capable of using political deception as easily as brute force. Maybe that is coming next episode? And lastly, the seductive Ursula is poor Hollywood invention, but I am really enjoying this addition because I don’t know what is going to happen. Stay tuned for Historical vs Hollywood to be posted after episode 2 airs on April 12th. Please also let me know if people are curious about which parts are accurate or if you rather just sit back and enjoy Henry Cavil getting all sweaty. If no one is interested then I am probably not going to continue this thread. I absolutely refused to watch this show after the first few episodes of Season 1 when they combined Henry's two sisters into one and made up a whole bunch of stuff. Thanks though for watching it for me and saving me the money of ordering it from Netflix! Season one was pretty fast and loose with the facts. But I have to say that this first episode of season 3 was pretty accurate. I actually did not include every detail that they got right...there were many more. And the few details that were mucked with seem to make sence from a plot perspective. oh thanks.. i love Tudor history.. saw season 1 & 2.. yeah was disappointed with facts twisted.. forget the the two princesses merged to one..who looked awful by the way.. no the way Mary Tudor should have looked.. I watched this episode last night and thought it was pretty good. I like the idea of these posts - even if I also enjoy watching Henry Cavill getting all sweaty! I'm not sure what happened to Norfolk but I don't think he was around much (if at all) during season two either, was he? I'd love to hear what is historically correct and what is the writers taking liberties. Happily, I can just watch it as a historically based soap and let the rest go. I admit to rolling my eyes to some of the "mistakes" but that's what I get for studying that era extensively during college. I saw the edited version of the first episode thanks to iTunes and can hardly wait for April 5th! Gosh this is probably the coolest blog I have yet to find and I love this Hollywood vs Truth! 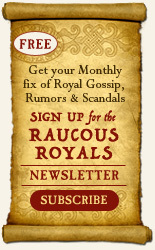 I am totally subscribing because I love the Tudors and better yet I love to know the real story and where hollywood decided to fluff it up! thanks for the post is was AWESOME! Please continue with this topic! I don't watch the show, but I love reading the comparisons you made. I wasn't sure there was much interest in the real history behind the drama. ok so this will be a regular thread posted the day after the Tudors airs. I usually annoy my husband while we watch it saying constantly..."that really happened" and "that's bogus." So now I will just write it down and annoy everyone else. yey! I love the Tudors' history!!! sorry for being intense haha but yeei! I hope you keep posting these reviews! I love watching the Tudors, inaccuracies and all, because it's fun to put faces to the names that I've always been fascinated by. I'm getting excited to see how they get JRM to fatten up when he gets his leg injury...that should happen this season, right? He got wounded the same year he married Jane Seymour. Although maybe they'll keep him skinny for a while. Nope, I am afraid JRM will still be a hunk of man meat (minus the meatiness). No fat suit for him. But at least they are doing the festering leg wound and slicked back hair to make him look less like a rock star. Mostly I'm able to partake in "the suspension of disbelief," let Hollywood do it's superficial nonsense and enjoy it as entertainment. But if I begin to slip and find myself beginning to get distracted by JRM's annoying lack of looking anything like the real Henry, I just try and picture good old Charles Laughton in his place. That usually works! Please do continue with your wonderful posts on "The Tudors!" Thank you! Wow, I had no idea people hated 'The Tudors' so much! Just reading some of these comments, you'd think 'The Tudors' were as bad as TOBG...but everybody is entitled to their opinion. I enhoy watching it despite it's many flaws, because the people who made have said they aren't going for extreme accuaracy, so they aren't claiming that the show is the truth. Oh, btw, Henry Czenry whole played Norfolk up and left atfer the first season, for some reason he was not recasted. I absolutely love The Tudors, bodice ripping, fiction or not, I love it all! 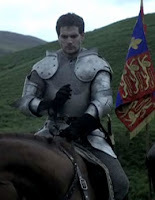 JRM is lovely as King Henry. And for those of you who say he doesn't look like King Henry, I say do you know absolutely what King Henry looks like. No I didn't think so. He's portraying a man who died centuries ago. Yes there are paintings of him, but myself being an art teacher can tell you that not every painting is an exact replica of the sitter. (And historians suggest that Henry was at one time a very good looking man.) Just look at Henry's fourth wife's painting and read about how Henry reacted when he actually saw her. Anyways, this is a brilliant blog and I will be reading it! 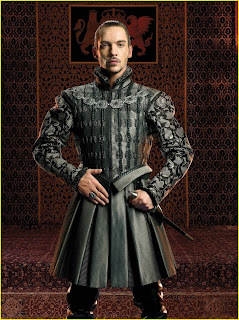 In response to ARK, my post about JRM not looking like Henry VIII is really meant as jest. The whole series has it's style, which is very typical of Hollywood treatment of most topics. As for knowing what Henry VIII really looked like, you're absolutely right. From what I do know about him, (or think I know), I'd never ever want the chance to meet him in the flesh to find out. But art teacher or no, it's clear that Mr. Rhys Meyers comes nothing close to any depiction I've ever seen of this King, and there are many portraits from his various ages for us to get a sample. It actually doesn't bother me a bit. I'm more amused by the fact that the series refuses to come anywhere near the heretofore accepted visual accuracy with him, and that while they refuse to make him fat or red headed, several inches of lifts are okay to make him appear taller. So, we liked the height, but not the girth? But I am curious to know from a historical vantage point which bits are based on fact. I admit to having a passion both for entertainment and history, so The Tudors has been great fun. You know...I think Myers just likes wearing heels. :) He was on The View today and I swear he was wearing heels. But he sure is cute! I loooooove that you differentiate between historical and Hollywood!!! As someone who follows along on Wikipedia while I watch the show, I'd love this thread to keep going! Ooh, please keep it going! I'm subscribing so I can keep reading! I'm fascinated by the diffs between Hollywood & History, although I enjoy both sides! I have watched the Tudors off and on since it began. I, like the first poster, got kind of upset about some of the liberties that they were taking...like one of his sisters being married to the King of Portugal. Huh? Anyway, I love history and have returned to watching the Tudors. I have forgiven them for some of their earlier abuses of the real history. I loved the last episode with Anne's beheading. So please keep giving us the real stories and show us what liberties are being taken by the producers of The Tudors. I'll read your reviews and also watch Cavill demonstrating how to be a real hottie! Rhys Meyers is no slouch, either! I'm willing to over look the ridiculous plot assaults on history. However, I can't forgive the show's producers for not making Henry gain weight. Yes, Henry was quite the porker by the end of his marriage to Anne Boleyn. Yet he still managed to keep on attracting the ladies - because he's the king. Shame on Hollywood's distortion! thanks for your post- very interesting. But who is the young man with the birthmark? I thoroughly enjoyed your post and sincerely hope you continue posting! I have watched every episode of Tudors from start to finish and yes they do take liberties but if I wanted straight facts and not a fictional show I would have read my history books that I used to obtain my degree. This is supposed to be fun, not facts... Just my opinion. So glad I found your blog. I love historical drama and always wonder about accuracy. I always read everything I can find after viewing an historical film or TV show. I've learned more history this way than I ever did in school! Being a Catholic in recovery who spent 12 years in Chicago Catholic schools I am fascinated by the Protestant reformation. I never heard about the rebellion of the northern Catholics. Wow. Please keep the thread going. I understand the reason for the inaccuracies (good looking actors (H. Cavill-mmmm), flow of story lines, etc. I think that adding more soap opera might entice people to go to the library or on line and read more of the historical facts and learn. Anything that gets people interested in learning more is good! I completely enjoy your "comments" and writings so PLEASE MADAM.....continue! Miss Mahon is absolutely correct about this flagrant mistake in the first season There were two Tudor sisters of henry they were the princesses mary and margret. Margret married King James the fourth of Scotland and The younger princess Mary wedded the aged King Louis the Twelth of France Mary was known as '' The French Queen'' Although this may be a small matter,it of the gravest importance to British History for it was through Margret Tudor that the royal lines of Stuart and that of Hanover came to being. Princess Mary married Charles Brandon, they had issue a daughter named Frances who married Henry Grey of Dorset their eldest daughter Jane ,The Lady Jane Grey, known to history as ''The Nine Days Queen'' who was executed in 1554. I love the show but it bothers me that Henry's age and weight are so wrong. And yes, we do know what he looked like. He was 45 and prior to his marriage to Jane it took 8 men to get him up a flight of stairs when he was injured in a joust. He didn't get the chicks because he was hot.If Mr.Myers won't gain a little weight, at least cover the washboard abs. It's for your art, man!Is there no one on set that can make this guy look gross? Thanks for everyone's responses. I will have a new post this Sunday on episode 2 of season 3. I can't claim to know what makes a good drama, but I am guessing that the producers chose to amalgamate Mary and Margaret in an effort to keep the focus on Henry and the subplots down to a minimum. The Tudors will not be going into the story of Mary Queen of Scots or Lady Jane Grey. The series will end with Katherine Parr. If possible, I would like to keep the focus on season 3 and not errors in season 1. Mary is dead by this point and Margaret is left stuck in Scotland whining to her brother that no one loves her. (No one did). So Henry’s sister are irrelevant to this storyline. As far as Henry VIII not getting fat, I believe the producers wanted to keep the image of Henry as glamorous sexpot because they feared viewers might tune out if they saw a big fat blob being hoisted onto his horse. I don’t agree with this decision. Henry was obviously not the rock star of his youth and this distortion pushes the suspension of belief off the deep end. Still, I do think the puss filled leg wound and unctuous hairstyle might placate viewers angered by Myers rock hard abs. Or maybe you can just enjoy the rock hard abs? I know I will. Please do keep posting these reviews! I love this show... although I have to admit that I am not necessarily "feeling" this third season. Has anyone else noticed that this is a new Jane Seymour??? What happned to the girl in season 2? Also, this season just doesn't seem as sexuall and vibrant as season 2... Still, I will of course keep watching. Very intereting details - can't wait to see your notes on episode 2. Thank god for "onDemand" cause I've already been able to see it! I don't know if anyone else mentioned this but I heard the actor who played Norfolk left the show, which is why they've had to divvy up his role to other characters. Please continue your blogs on Historical v Hollywood. I absolutely LOVE the show but it's very nice to hear from someone who can iron out all the details. Thanks! This is fascinating. I hope you continue to update it! a new update is posted covering episode 2. Keep the thread going! I love the show and also contrasting the fiction with the facts! Kasandra – I will have to add that one to the post on episode 4 (http://blog.raucousroyals.com/2009/04/showtimes-tudors-historical-vs.html) because the son features prominently in that episode. Thanks for the update. I actually thought the son was supposed to represent the 4th Thomas Howard because in season 3 Charles Brandon has become an amalgamation of himself and Thomas Howard, The third Duke of Norfolk. Howard did have a son that was roughly the age of the mop-haired boy. (he is adorable!) but of course he was not married to Catherine Willoughby. ugh. Kind of a mess. Not sure how to detangle that one. The amalgamation of Suffolk and Norfolk actually bothers me more than the amalgamation of the sisters, because now they have to continue this mess with Catherine Howard’s story into season 4. (Instead of Norfolk securing her position in Anne of Cleves’ household and selling her out at the end...they are now going to have to have Suffolk play his role.)weird? But overall this season has pulled tons of real history into the series that has made me forgive the mucking with the characters. This may be a strange question, but Jane is seen using a fork while eating quail eggs. Were forks used at this time in England, I know they were used in Italy but I don't know if it spread to northern Europe. oh, I missed that one! I will have to add that to the post on episode 3. No, there should be no forks yet in England. (They called them the devil's pitch fork). And yes, you are correct...they were used in Italy. Catherine de Medici brought them over to France and from there they spread to England. btw, if anyone notices any other inaccuracies can you please post them on the episode that you saw them in. 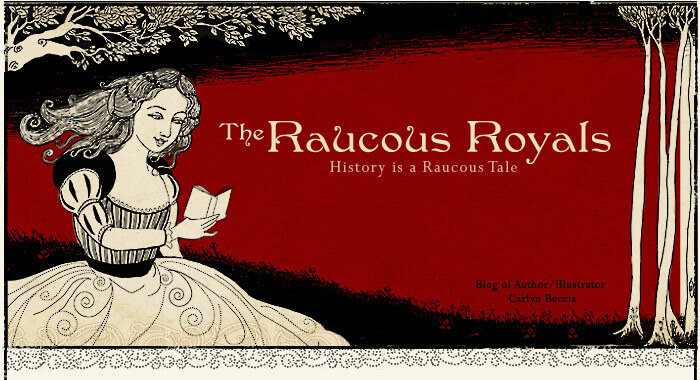 I love your blog and am very happy to see that you are giving us a history vs. Hollywood look into The Tudor dynasty - I am a big history nut and this is just fabulous! Keep it coming please!! Mostly, I am a stickler for accuracy when it comes to the Tudors. I regard the Tudors more as a guilty pleasure kind of thing even though I did get annoyed at several inaccuracies such as the blending of Henry's sisters,the fact that Mary/Margaret married a French king and not the King of Portugal and the fact they had Mary/Margaret kill off the King by suffocation.There was no Henry Percy and the suicide of Cardinal Woolsey was over the top.I have just recently found your blog and find it fascinating, please keep the thread going, it's great! i'm a great fan of The Tudors and always put the historical facts to the back of my mind when watching it, preferring the sit back and wallow in the unfolding drama, no matter how much it differs from the reality of the times. I do not understand why viewers and critics are making a big deal over the historical inaccuracies of "THE TUDORS". They tend to act as if this is something new. Historical inaccuracies in works of fiction has been around for a very, very long time. Even some of Shakespeare's work has historical inaccuracies. The Tudors was a show that took us back into the time of kings, how they maintained their rule, took care of political matters, defeated their enemies in battles and at the same time took care of their lavish personal lives.